^ Bonesteel, Matt (October 22, 2015). "ESPN layoffs will gut the network's production staff". The Washington Post. ISSN 0190-8286. Retrieved February 3, 2016. ^ a b Bort, Ryan (April 21, 2010). "Bill Simmons Announces New Website, The Ringer". Newsweek.com. Retrieved February 28, 2017. ^ Samer Kalaf (February 17, 2016). "Bill Simmons's New Site Has A Name And Some New Hires". 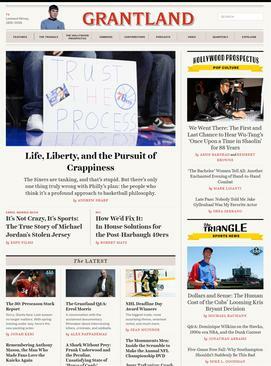 Deadspin.com. Retrieved February 28, 2017. ^ Pedersen, Erik (April 4, 2016). "Bill Simmons To Produce For 'Game Of Thrones' Aftershow On HBO". Deadline.com. Retrieved February 28, 2017. ^ Michael O'Connell (April 26, 2016). "Bill Simmons' HBO Show, 'Any Given Wednesday,' Arrives in June". The Hollywood Reporter. Retrieved February 28, 2017. This page is based on the Wikipedia article Grantland; it is used under the Creative Commons Attribution-ShareAlike 3.0 Unported License (CC-BY-SA). You may redistribute it, verbatim or modified, providing that you comply with the terms of the CC-BY-SA.